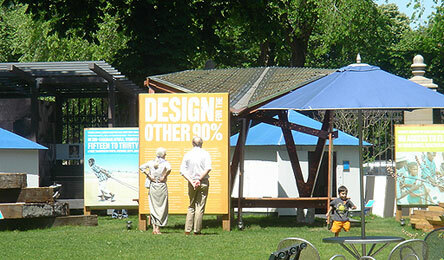 The Cooper-Hewitt National Design Museum has a show this summer entitled, Design for the Other 90% (you likely guessed that because of that orange title block above). This issue has fascinated me since I was in college in the late 60s - most design, billions of dollars worth, is produced for the top 10% of the planet, for the more well-off and industrialized nations. Some examples: though accounting for only 5 percent of the world's population, Americans consume 26 percent of the world's energy (American Almanac) and produce 25 percent of the carbon dioxide pollution from fossil-fuel burning. Industrialized nations, with 20 percent of the world's population, consume 87 percent of the world's paper (Klaus Toepfer). 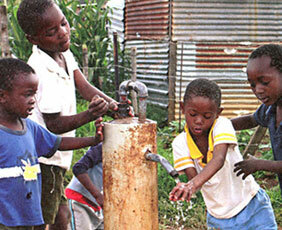 Nearly half of the world's population lives on less than $2 a day. 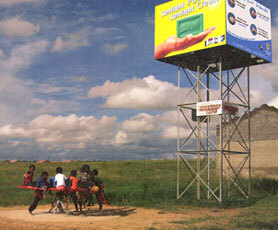 There is a huge undeserved population that needs great design - innovative solutions to problems. Problems of food, clean water, education, skills; not problems of gloss or matte paper, which typeface for the annual report, marketing soda to teenagers, etc. Designers are trained to make things better, to address social ills as well as competitive commercialism. Most designers spend their entire career designing new logos, brochures, annual reports, etc. for a highly commercialized and competitive environment. Imagine if designers spent 10% of their time, talent, and resources to help people grow crops more efficiently, to get and keep water that is pure, to harness energy efficiently and cheaply, or to communicate to each other over long distances. Designers, then, truly could and would make a difference. A movement is growing both within the professional design community and design schools to direct our practices toward socially responsible, sustainable, humanitarian design. We can better prepare solutions that are simple, cheap, easy to produce and distribute, and meet a direct human need. An early advocate was Victor Papanek. In 1971, he published his ground-breaking book, Design for the Real World: Human Ecology and Social Change in which he indicted the Western consumerist mentality as well as the design community: "the genuine needs of man have often been neglected by the designer." These goals, announced in 2000, encourage a commitment from wealthy countries to commit resources and from poorer countries to improve policies and governance. 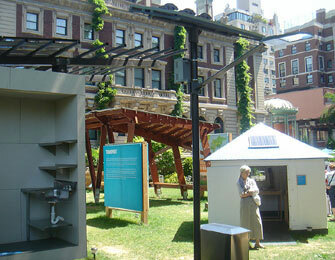 These fotos show a few of the solutions and exhibits in the garden area of the Cooper-Hewitt museum. A bit weird and ironic since this was the backyard of Andrew Carnegie, one of the wealthiest tycoons in America. Safe straw that filters water as the user drinks from a pool. 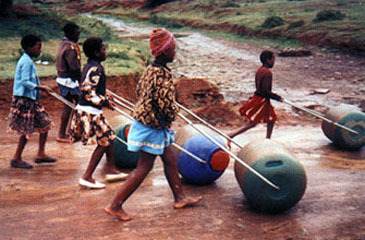 Kid's merry-go-round that pumps water up to a storage tank. 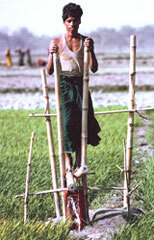 Pump operated by foot walking action. 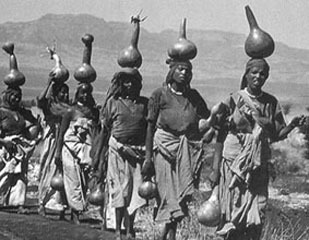 Gourd-on-head way to transport water, replaced by larger capacity and safer rolling jugs.